Note: This article is part of the StanGrad series highlighting Stanislaus State students who are part of the Class of 2017. Read more StanGrad profiles . Alondra De La Cruz has always wanted to be a journalist. A first-generation student and U.S. citizen, Stan State was the only college within her financial reach, so she pursued a journalism minor with her communications degree. In the fall, she will follow her dreams of becoming a multimedia journalist by attending UC Berkeley for graduate school. “When I look back at my experience here at Stanislaus State I see so many opportunities that came my way and that I took advantage of,” De La Cruz said. 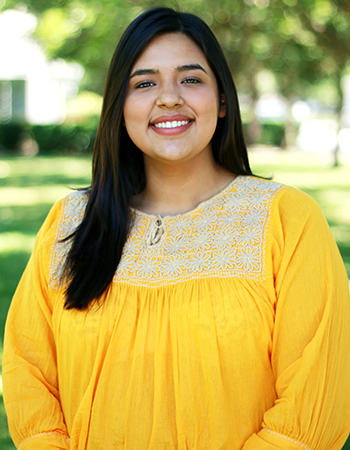 In addition to getting on staff with the student-run newspaper The Signal, where she served two years as an editor and reporter, De La Cruz also worked at the campus radio station KCSS and interned at KCRA 3 News in Sacramento. It’s that determination that helped her graduate school application stand out, according to Shannon Stevens, a professor of communication studies at Stan State. Moxie, yes. And also De La Cruz is quick to thank those people who supported and helped her along the way. What memories stand out most from your time at Stanislaus State? Which faculty or staff member had the greatest impact on you, and why? What advice would you give to current and future students?